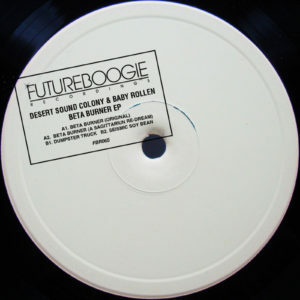 Quirky and trippy house flavours are served up by Desert Sound Colony and Baby Rollen on the ‘Beta Burner’ E.P., with added psychedelic flavours courtesy of an A Sagittariun Remix. Hot of the heels of stellar releases for Touch From A Distance, Snap Crackle & Pop, and his very own Holding Hands Records, Desert Sound Colony debuts for Futureboogie, and delivers a trio of collaborative tracks with Baby Rollen, and a solo jam to boot! Title track, ‘Beta Burner’, is built upon an infectious break- beat groove and bumping sub-bass line; Rhodes chords jostle for position with dubbed out tones, synth hits and acid riffs, as this colourful and contagious track works its magic. Bristol based techno dreamweaver, A Sagittariun, summons up the original track’s darker elements for a slower paced, but just as deadly, “Re-Dream”. ‘Sagi’ slingshots his remix with tribal snares and a typically transcendental arp riff over muscular beats. The inventive and playful work continues on ‘Dumpster Truck’, with the gargantuan bassline taking centre stage, supported by swinging broken beats and frisky sound manipulation for a truly enjoyable ride. Wrapping up the EP, Desert Sound Colony goes solo on ‘Seismic Soy Bean’, ramping up the funk factor past 11, and dishing up the kind of headsy, happy tech grooves that the likes of U-Freqs and Wiggle were foraging at the turn of the millennium, to great effect.